Disclosure: I am a brand ambassador for True Aussie Beef & Lamb. (Yes, I’m very lucky to be working with a great company!) And, I’m compensated for creating recipes and posts, including this one, ‘Own Your Party Entertainment Ideas’, for them. Believe me, I don’t partner with any brand unless I truly believe in and support their product(s) and the kind of company it is. One that’s shares similar values as I. Most importantly, I only work for food companies whose products I would feed my family and friends! 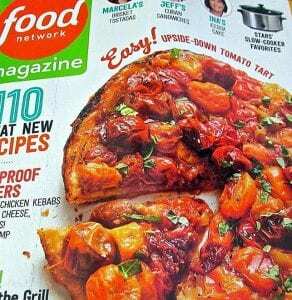 All these opinions and the creation of this recipe are credited to me. Yeah, you entertain year-round, but probably your real entertaining ignites right after Halloween. That’s when it all happens! The ‘Holidays’, in the Western world and Western-influenced countries, explode in full glory. While we certainly see snippets of the holidays, as in Thanksgiving, Christmas, Hanukkah, Kwanzaa, and New Years, even before Halloween, the “full blown Monty” so to speak happens right after we take off those costumes and masks. When we’re hunkering down for ‘most wonderful time of the year’ or are we? For some it can be like being on a hamster wheel trying to get it all done. Maybe spending way too much money. Running up credit card debt. Trying to be everything to everyone. Hey, I’ve known friends who’ve scheduled up to four parties in one evening. Darting and making appearances at all. Wears you out if you let it! Sounds like party torture to me! 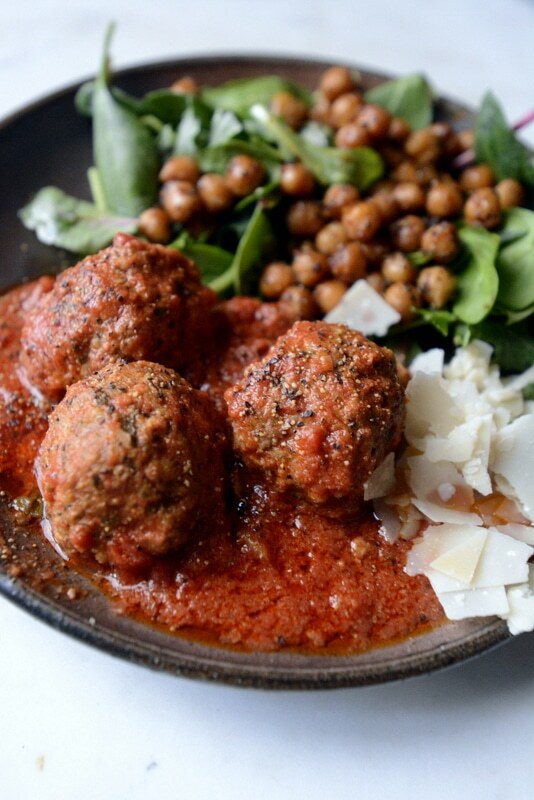 Before we get started with entertaining ideas here’s one of my favorite recipes for meatballs using Aussie ground lamb! You’ll see how easy it is. Actually, don’t be ‘intimidated’ by the list of ingredients, it’s mostly all spices! For more great holiday recipes and to see where you can buy Aussie Grassfed Beef and Lamb in your area visit their website! While the meatballs are cooking, prepare the garbanzo beans. Heat a medium skillet on medium heat. Add the olive oil, beans, harissa and cumin. Toss and blend well. Cook about 7-10 minutes over medium low heat. 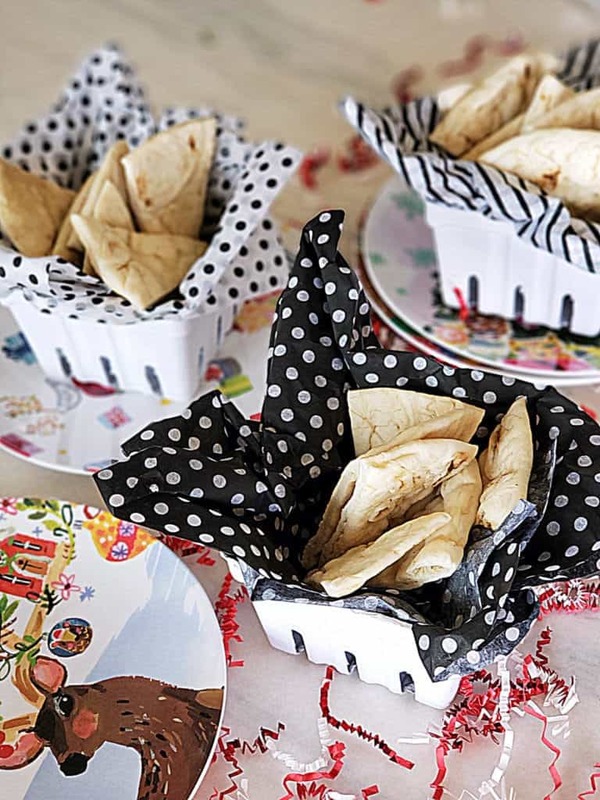 Now, on to those quick, easy and oh, so special, party ideas! Let’s start with an important premise about parties. Entertaining should not be exhaustive. Oh, sure, it’s work and planning. And, if you do that then the execution and delivery can roll out rather seamlessly. 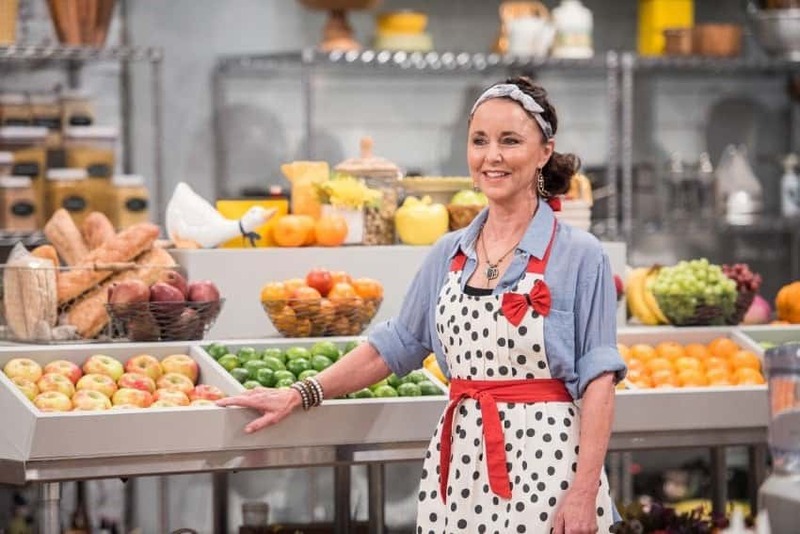 It is truly my hope that you’ll find some inspiration for new ideas, feel more motivated to maybe change things up, and even err on the side of whimsical and fun with your entertaining! Life is so short. It’s good to have small outlets of happiness! Here’s a few things to remember when you go down the rabbit hole entertaining route. 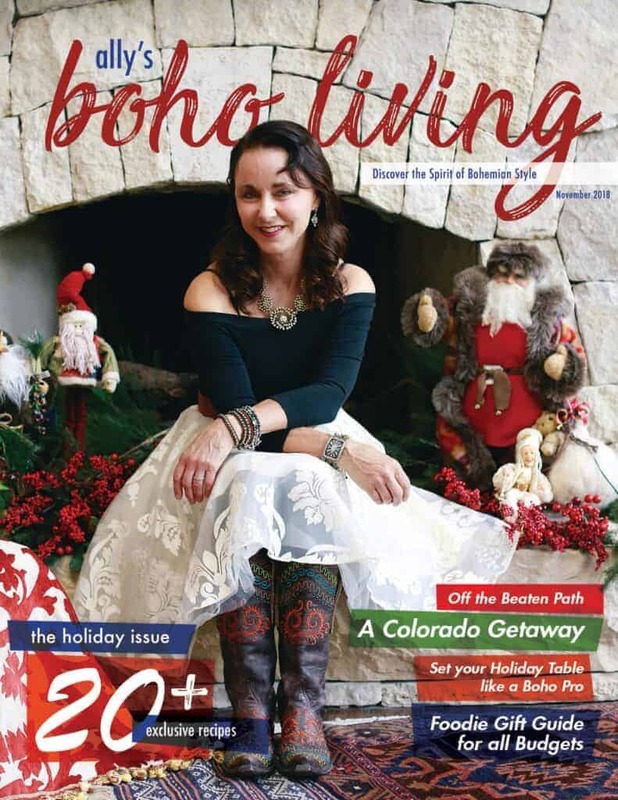 Decide your budget—if you’ve going to invite friends over for cocktails, have a holiday dinner party, host the family’s big dinner for the holidays, maybe throw a New Year’s Eve bash, for gosh sakes, don’t overspend beyond your means. Decide your ‘Ambiance’ Theme—What I mean by this is mood. What do you want to create? What experience do you want your guests to have? Are they coming for just a drop in? Will family including children be invited? Are you trying to create new connections for friends and family? You know like you might need name tags because there are so many who don’t know each other. I prefer hosting smaller more intimate grown up gatherings, where old and some new friends meet. We’re talking anywhere from six to maybe 18 to 20 people. Decide the menu—The menu is usually dictated by the number of folks you’re entertaining. A small dinner party may mean a full meal is served. Maybe with ten to twelve people and you roll out a buffet meal. Or if you’re closing in on nearly twenty-plus party animals maybe just nibbles, as in tapas and mezze eats. Establishing this part of the entertaining is big. It affects everything else that can happen in the event planning process. Develop the plan—I’m not talking a dissertation. Just making jot notes and keeping your ideas and thoughts flowing so you avoid those frazzled, OMG, I forgot, moments! We know that this, in turn, spills over into stress. And, that’s counterproductive to having a good time! Having these notes also helps you stay on track and check off what needs to be done and when. Sometimes for me this is just a legal pad that I keep on the counter in my kitchen. And, in the weeks and days before hosting the party, I’m making jot notes and checking off. Believe me, you get a great sense of confidence doing this knowing details are in order. Would love for you to check out some of the parties I’ve hosted, large and small, for Aussie Grassfed Beef and Lamb. Yes, I really get off on party planning and party execution. It’s a passion, and it’s a wonderful passion that makes others happy, brings joy to them, and lets them escape for just a few hours of something magical. You’ll also see some fabulous recipes using True Aussie Grassfed Beef and Lamb! My goal is to make life a tad bit easier for you, so these recipes, like most I create, are super simple yet outrageously delicious! Now, let’s look at some cool ideas that I’ve used or plan to use in entertaining! There’s double duty in these fabulous little cubes, the pretty factor shines plus it keeps your drink chilled. I like to use a pineapple, or other fruit juice or even ginger ale, liquid when I want a slight flavor like to sparkling water or drinks with the flavors of the cubes. Drop in a few cranberries, blueberries, raspberries or even herb leaves like mint. So simple, yet something truly special . Those plastic ice cube trays can be found at dollar stores! 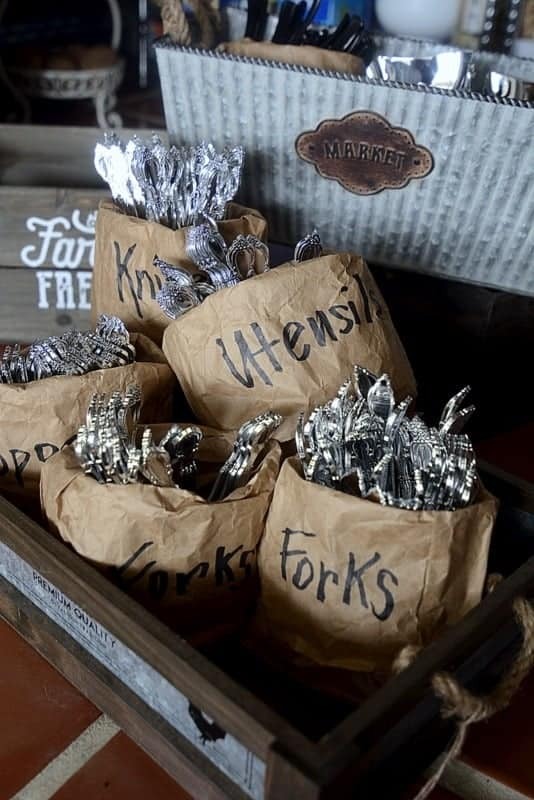 If you’re serving up a crowd and want to display your eating utensils cleverly, then just get brown paper lunch bags, write with a big fat Sharpie ‘Forks’ (or spoons or knives), add some anchoring substance, like rice or beans, into the bottom of the bag, roll down the bag then put in your utensils. I love to use this idea with plastic eating utensils. Adds a bit of pizzzazz! Of course, you can do so many things with those brown paper bags. You can make your own napkin rings. You can add a few touches, like even live herb stems to napkin rings that add a special touch. When your guests take their seat at your table, man, oh, man will they feel special! 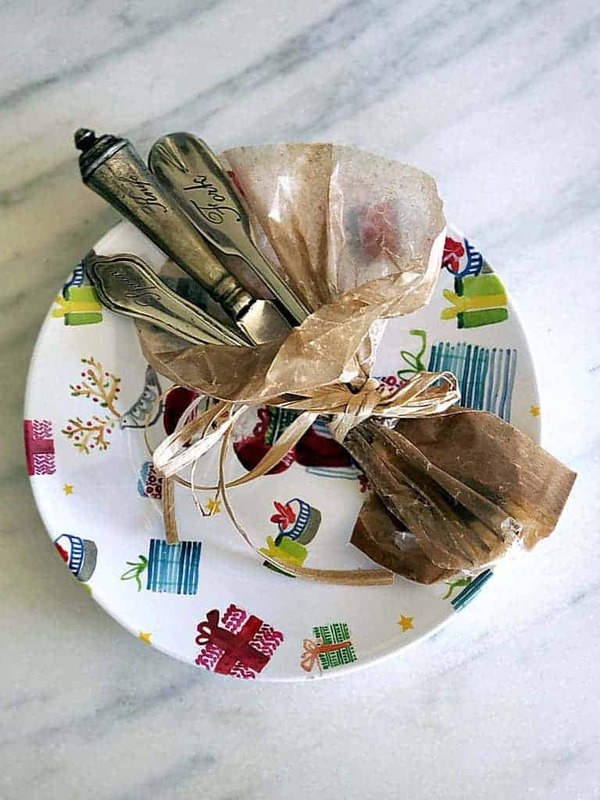 Oh, yeah, you can use napkin rings, but why not go boho rogue by putting the utensils in wax paper bags. 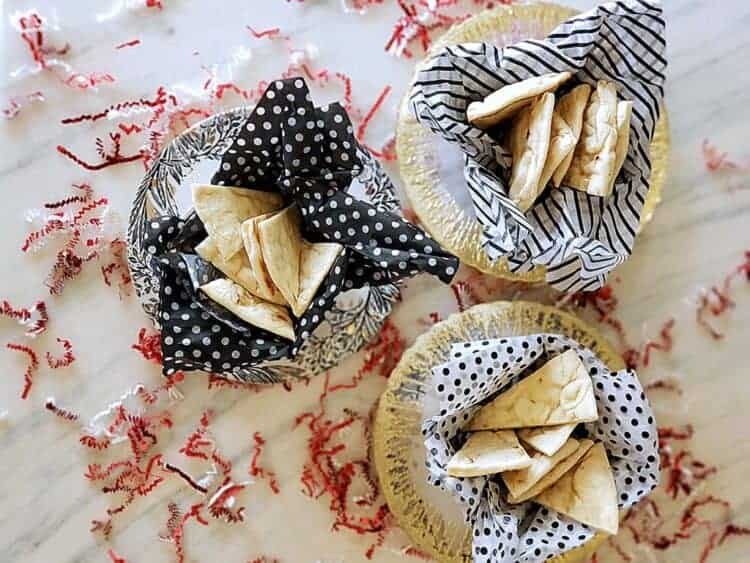 Reynolds Wrap makes these wax paper bags and they can be used for not just sandwiches or cookies! 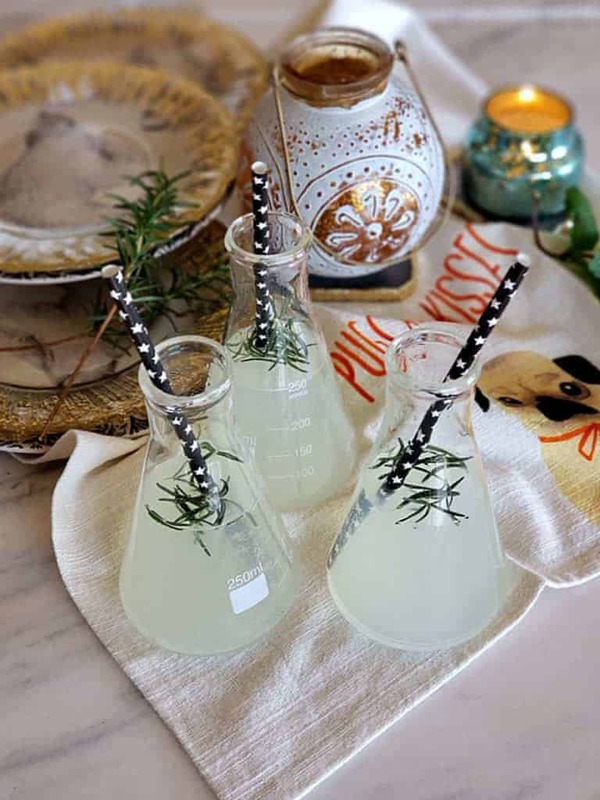 OK, you’ll need a straw, but how cool is it to offer your guests drinks from these chemistry class beakers. Yep, you’ll have to use a funnel to pour the drink into them, but it’s worth the ‘fun factor’ effort. And, if you’re serving a signature drink for a party, this will surely be memorable. You can get these rolls of brown paper from craft stores or online. It’s amazing the ways you can use it. 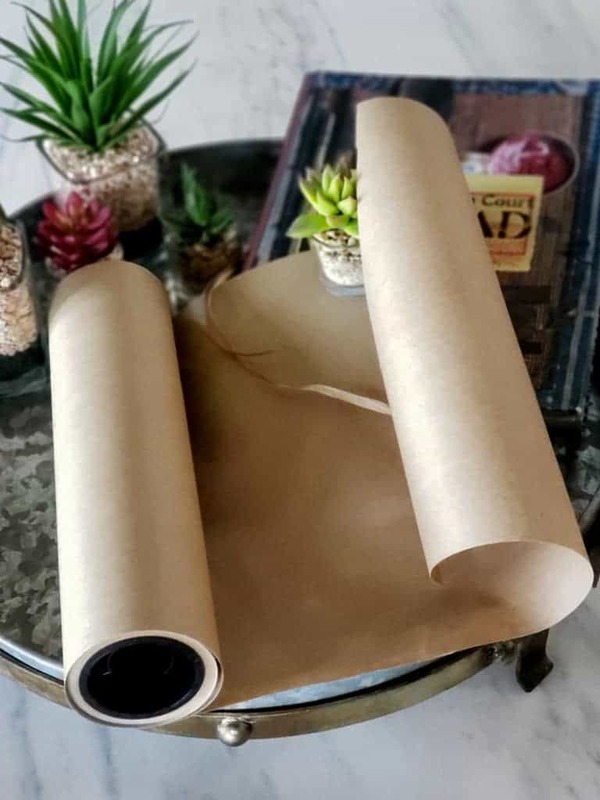 From a table runner, where guests write notes to you (leave Sharpie pens on the table) and wrapping paper to place mats and menu displays, I love using this paper roll for new entertaining ideas. 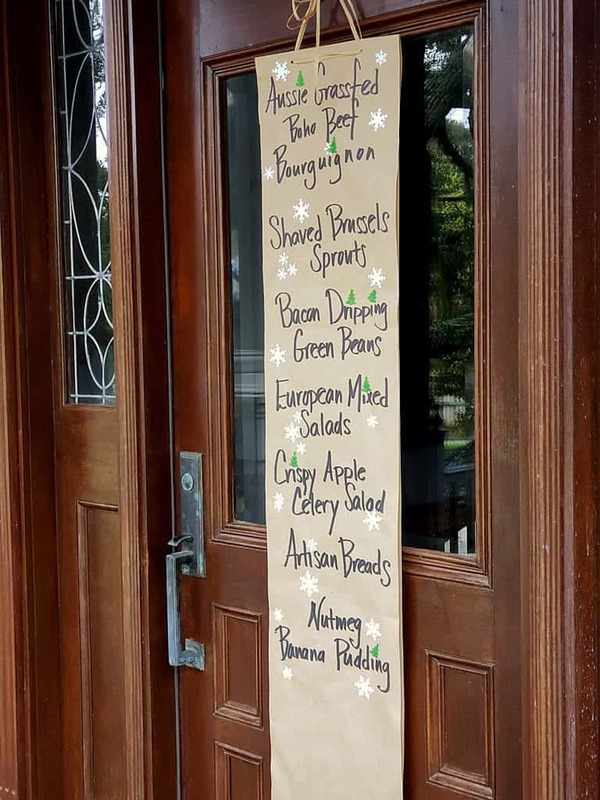 Don’t throw out those old-fashioned brown paper grocery bags. OMG, they’re perfect for cutting up and using for lots of things. From notecards to menu cards and more. 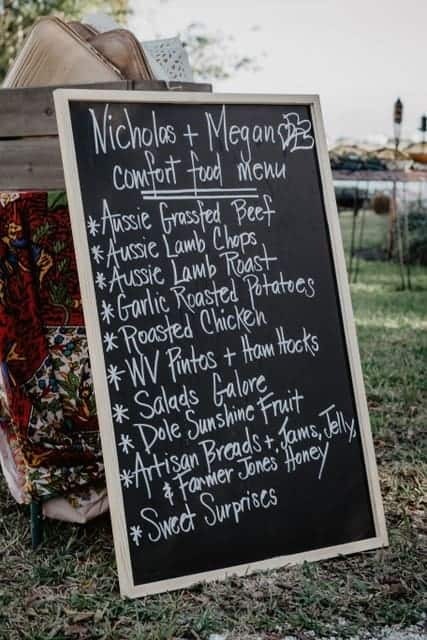 And, don’t forget you can share the menu on large things like chalkboards. You can get soooooooooooooo much mileage from a cheap grocery store bouquet and if you want to expand that buy a bouquet of baby’s breath, too! 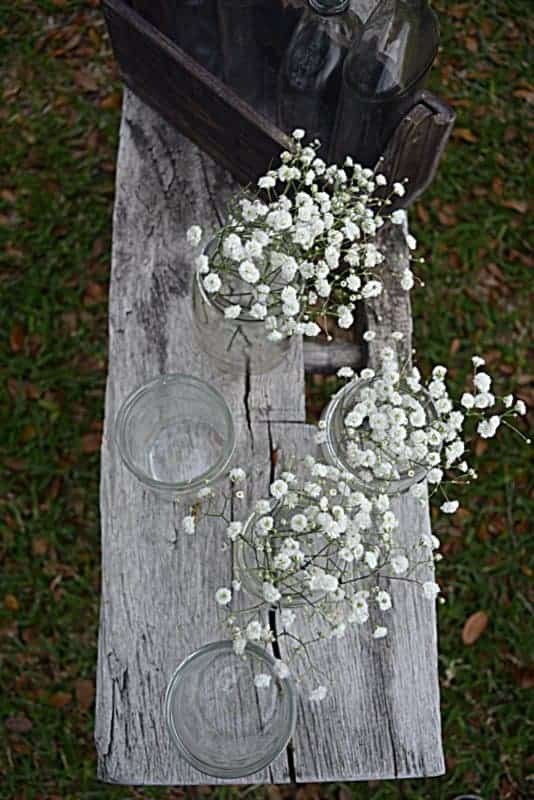 Old mismatched jelly, jam and food jars work perfectly as vases and a few stems of flowers with a fluffy full stem of baby’s breath and you’re in business. 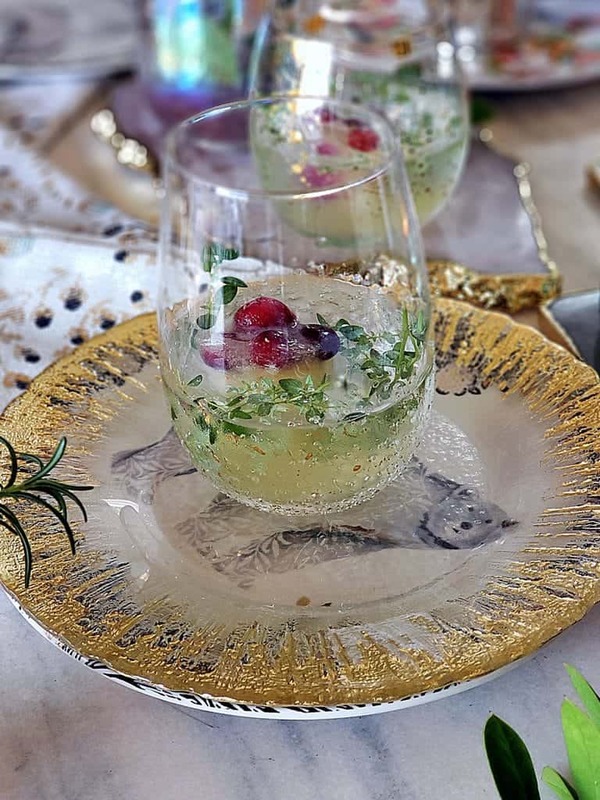 You can also take the baby’s breath, snip a stem and slide in with the napkin rink or just place on the plate. 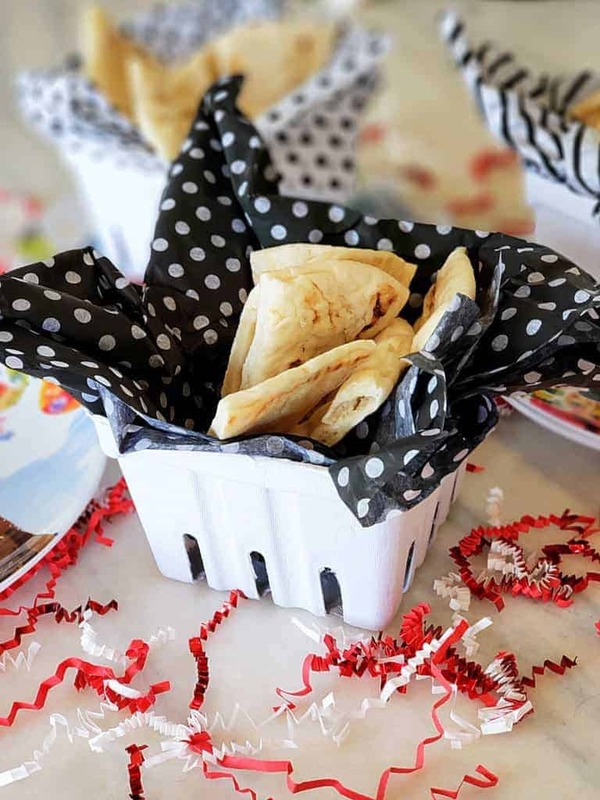 You can so find these products at dollar stores and they go a long way in decorating tables and more for your parties. Scatter some on the table and it’s already festive with nothing else added. Put it in a bread basket with your warm bread. Lots of ways to use this to bring out happiness! Another great product you can find at the craft store, and these paper cardboard berry cartons sometimes come in various colors. I love simple white because I use it’s more versatile for me. 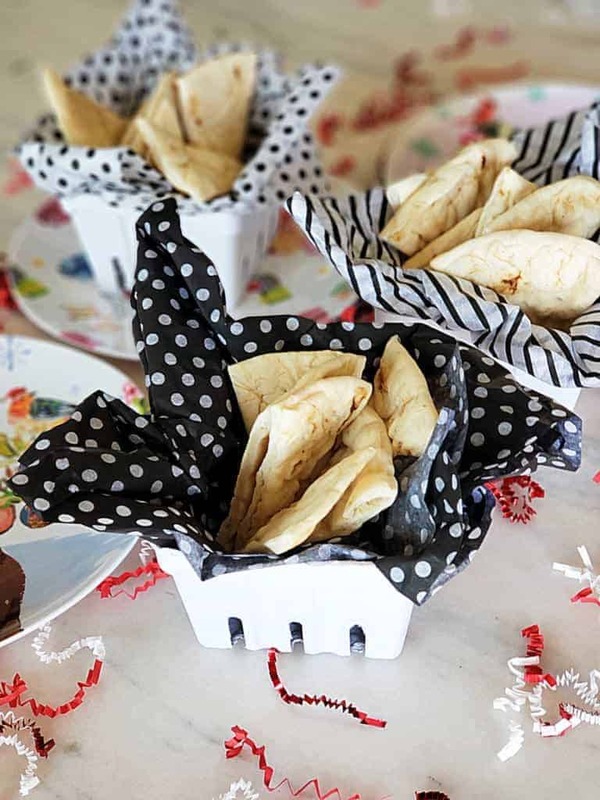 It makes a cute individual bread basket for guests. Simply line it with some wax paper, parchment paper, tissue paper and place the bread in it. Don’t think tissue paper is just for wrapping gifts. 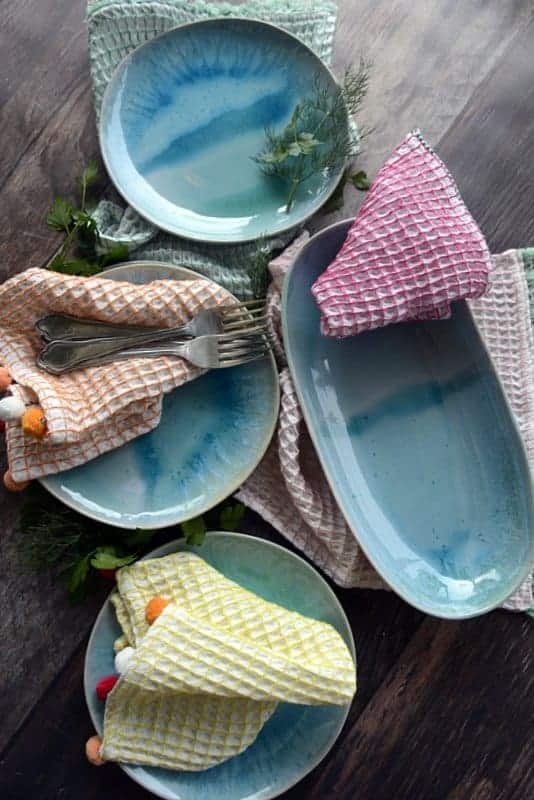 Since it comes in so many patterns, styles, colors and textures, it’s perfect for a lot of entertaining ideas like wrapping French banquettes to lining the individual bread baskets. You can even get more crafty and make tissue paper flowers! Who says napkins have to be napkins. Dish towels can be napkins. Dish cloths can be napkins! 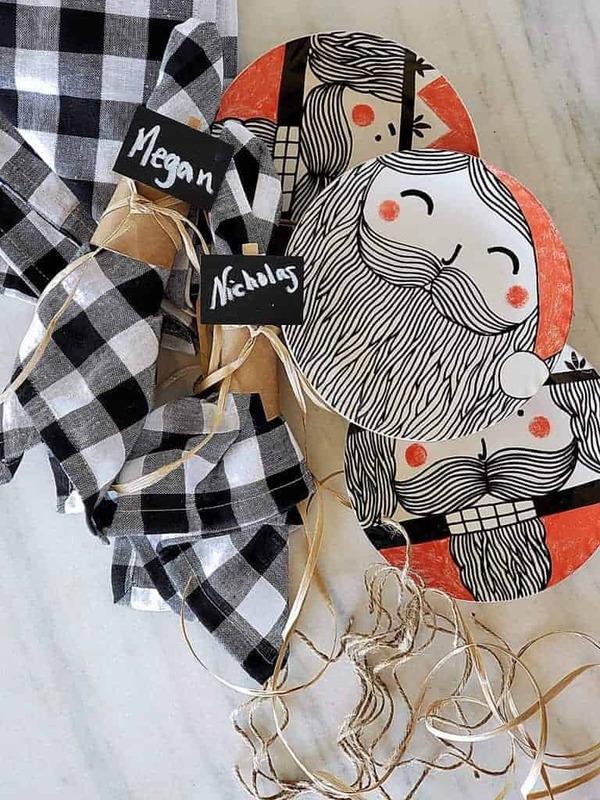 And, when you find really stylish unique ones, like these from Anthropologie, well, you just want to use them first as napkins! As always, Ally, your endless entertaining ideas leave me breathless and excited at the prospect! Remember when I set up my “Boho Blue Christmas” table a few years back? 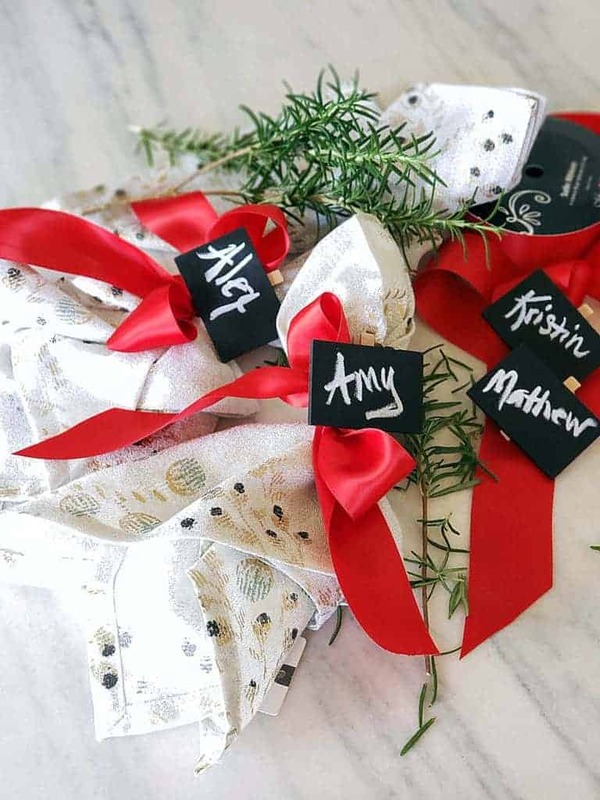 All the baubles and “pretties” are now a distant memory, but this post proves that you don’t have to spend a fortune to make things festive. So cute and creative, xo. Love you!